Located to the south of Switzerland, Lombardy is a unique and stunning region of varying landscapes, from the beautiful Alpine area to the renowned Lakes region. Settled originally in 2000 BC, the area was ruled by the Romans to great success, growing to one of the most prosperous regions in Italy. After the fall of the Western Empire, Lombardy deteriorated under the strain of numerous invasions but recovered through increased trade and agricultural development through the 13th century. Though internal strife negatively affected the area in the 14th century, Lombardy joined the Kingdom of Italy in the 1800’s and has become the most developed and prosperous region in Italy. 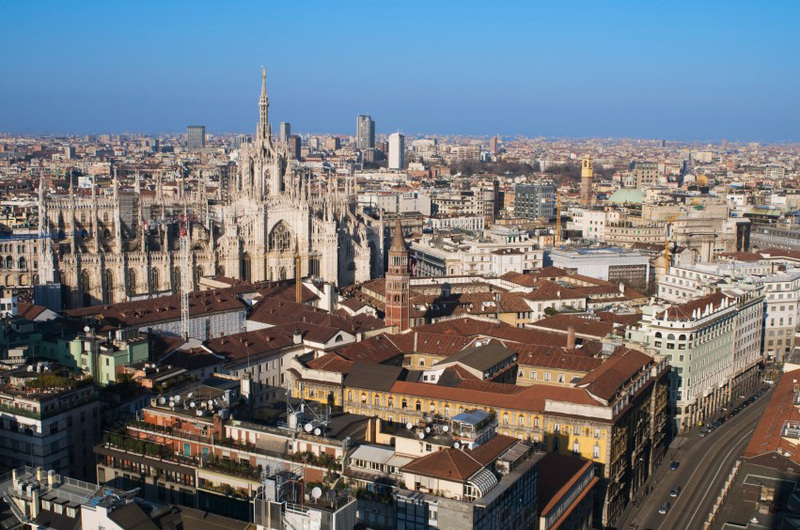 Milan, the capital and economic center of Lombardy, is one of the world’s cultural touchstones and is a leader in the arts and in the fields of architecture and fashion. Of the twenty regions in Italy, Lombardy is perhaps the most diverse in its landscape as well as the wide range of cultural experiences available, from the chic streets of Milan to the famous ski resorts of the Dolomites to the peaceful beauty of Lake Como. Perhaps the most famous of Lombardy’s sites is located in the convent of the Santa Maria delle Grazie church in Milan: Leonardo da Vinci’s painting “The Last Supper” has drawn millions to marvel at the mural. For those who are seeking an outdoor experience, Lombardy has 133 protected parks, reserves and sites that showcase waterfalls, glaciers and woodland areas. 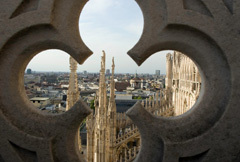 The second largest city in Italy, Milan is a vibrant, energetic city that blends history with a modern aesthetic. A force in the field of fashion that houses one of the world’s most treasured pieces of art, the city has a unique sense of antiquity and modernity. 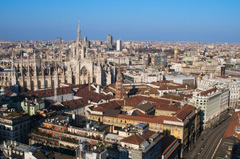 Settled by the Gauls in 400 BC, Milan was the capital of the Western Roman Empire during Roman rule but later was virtually destroyed during the Middle Ages. The city recovered and was ruled briefly by Napoleon, whose demise left Milan to the rule of Austria. After a rebellion that forced the Austrian controllers out of the city, it became a part of the Kingdom of Italy, flourishing in the 20th century to become the country’s second largest city. However, Milan once again faced near total destruction during World War II but was rebuilt. Today the city is once again seeing a renewal as major construction has begun to convert old, industrial spaces to office space, housing and other buildings to reflect the move from an economy driven by heavy industry to one built on services. This architectural rebirth will be exciting to witness in the upcoming years. Though the renewal project focuses on Milan’s present and future, many of the remarkable sites of the city reflect its past. Built in the 1300’s, the Duomo is home to nearly 3500 statues and is an amazing architectural landmark. There are many churches and basilicas within the city but the Basilica of Sant’Ambrogio is not only beautiful it contains artwork and artifacts that help to tell the history of Milan. The Santa Maria delle Grazie church is another architectural monument and is also home to Leonardo da Vinci’s famed painting, “The Last Supper”, which covers a wall of the refectory in the convent. There are also many museums, such as the La Scala Theater Museum and the Pinacoteca di Brera (Milan’s oldest museum), which help illustrate the great impact Milan has had on the world of art, music, theater and literature. The Museum of Science and Technology, which has many of the machines and models of Leonardo da Vinci, is renowned as one of the most fascinating museums of science in the world. And while there are a multitude of other sites and landmarks to visit, walking the city and discovering the boutiques and coffee shops of the Brera, wandering through the Porta Venezia Gardens or experiencing the charms of the Navigli district perhaps best informs one of what Milan is truly about. Lying at the foothill of the Alps 40 kilometers (24 miles) northeast of Milan, Bergamo is a city whose quiet streets, despite being less well known among tourists, offer a wonderful opportunity to experience Italy on a more intimate level. The peaceful beauty of Bergamo is all the more unique given the city’s turbulent history, starting with its near destruction by Attila the Hun in the 5th century to the acrimonious fighting in the 11th century of the Guelphs and Ghibellines. Bergamo fell to the rule of several different factions, leading to the construction of a defensive wall around the upper portion of the city, until finally joining the Kingdom of Italy in 1859. However, Bergamo’s rich musical heritage has left perhaps the deepest impression. The Santa Maria Maggiore church taught music and voice for over 800 years, many composers made the city their home such as Alessandro Grandi, Pietro Locatelli and Gianluigi Trovesi, and there is even a folk dance, bergamask, which was named after the city. Bergamo is also the birthplace of Commedia dell’Arte, a form of improvisational theater that is also known as “Italian Comedy”. While the beauty of the Alps is enough to warrant a visit to Bergamo, the city itself has many historical and cultural offerings. Bergamo is actually made of two distinct sections and can be traveled between through walkways, roadway or by funicular (cable car). Citti Alta is the walled medieval city that lies above Citti Bassa, the modern city center that has many neighborhoods and shops. The renowned Carrara Academy is located there as well and has a wonderful collection of artwork from the Renaissance period. Citti Alta has some remarkable historical buildings, such as the Palazzo Nuovo, the town square Piazza Vecchia, the Palazzo della Ragione and the serenely beautiful Basilica di Santa Maria Maggiore, which was built to include the relics of a religious building from the 7th century. There are also several museums, including a museum of natural science, and a gorgeous botanical garden. Walking the cobblestone streets and exploring the many shops, the quiet nature of Bergamo is apparent and affords a different sense of Italy. One of the deepest lakes in Europe, Lake Como is a mere 30 minutes from Milan yet feels worlds away from the bustling city. Surrounded by views of the mountains, the mild climate affords visitors moderate temperatures to enjoy the outstanding natural surroundings, as well as the remarkable villas built around the lake. Many of the villas are open to the public, including the Villa Carlotta and the Villa del Balbianello, while others have been turned into lush lodgings for visitors. There are several towns located along the lake, including Canzo, Colico, Como, Lecco, Bellagio, Tremezzo, Menaggio and Varenna. There is also one small, wooded island in the lake, Isola Comacina, which has seven churches on it and can be reached by ferry from Menaggio. There is much to see in this area. The center of the town of Como, the Piazza San Fedele, is walled and contains building and churches that are over 400 years old. Como is also home to the Baradello Tower, which can be reached by a short walk up a hill but rewards with an amazing view of the town and lake below. Another stunning vantage point is the small village of Brunate, located on top of a hill that can be reached by a cable railway or funicular. Also built along the hillside is the renowned Sacred Mount of Ossuccio, or Sacro Monte di Ossuccio, which contains 15 chapels that lead to a Monastery, all of which are protected by the UNESCO World Heritage List. Said to be the most picturesque of the lakeside towns, Varenna has beautiful villas and gardens as well as an ancient castle. For those who are more interested in the rigors of outdoor activity, excellent hiking and rock climbing can also be found all around the lake. With so much to offer, it’s not surprising that Lake Como is the most popular area of the Lakes Region. Italy’s second largest lake, Lake Maggiore, like Lake Como, has the remarkable Alps as a backdrop and has attracted tourists for over 100 years. Though the name “maggiore” translates to “greater”, it is not the largest of the lakes but is the longest at 65 kilometers (40 miles), stretching into Switzerland. The Mediterranean-like climate of the area provides for lush and exotic greenery and a perfect temperature to enjoy both the unspoiled natural surroundings as well as the vibrant towns surrounding the lake. Though the original commerce industry of the area supported the population, the introduction of a railway in the 1900’s allowed the lake to flourish. The influx of visitors prompted the building of hotels, inns and restaurants and the tourist industry boomed as more and more people discovered the diverse splendor of the lake and it’s towns. The Borromeo Islands, or Isole Borromei, are one the biggest draws. Made of up five small islands, Isola Bella, Isola Pescatori and Isola Madre are open to the public and are remarkably picturesque. Isola Pescatori is known as the Fisherman’s Island and is quite gorgeous. Isola Bella has the phenomenal Palazza Borromeo, named for the Borromeo family who once ruled the area. The home has lush, terraced gardens and an incredible collection of artwork. 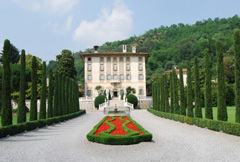 There is another Palazza Borromeo on Isola Madre that features a spectacular garden as well as a host of fowl, including peacocks, pheasants and parrots. 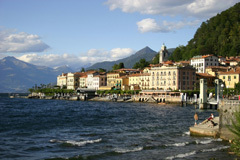 The islands can be reached from the town of Stresa, a site in itself. The town is renowned for the incredible 19th century hotels and villas, all built along the shore with views of the Borromeo Islands in the distance. Verbania also has beautiful villas and hotels, and hosts Garden and Book Festivals in September that highlight the more serene nature of the town. Lake Maggiore is host to other well-known festivals, including the Locarno Film Festival, one of the most significant in Europe, the Settimane Musicali in Stresa, and the Jazz Festival in Ascona, which features New Orleans jazz. 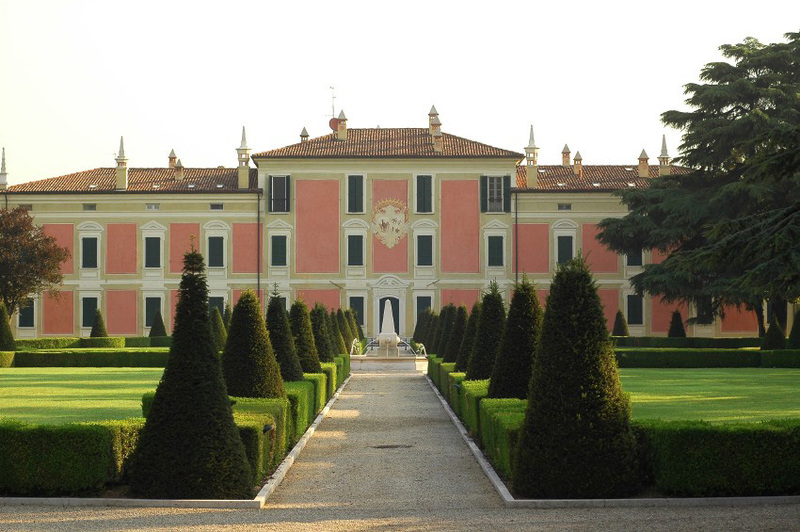 From the abundant gardens to the picturesque villas, Lake Maggiore lives up to the greatness of its name. Located halfway between Milan and Venice, Lake Garda is the largest lake in Italy. Formed by a glacier some 5-6 million years ago, the lake is 51 kilometers (31 miles) long and 158 kilometers (98 miles) around. With the Dolomite Mountains visible in the distance, Lake Garda is renowned for it’s beautifully clear water, enticing visitors to swim, windsurf and sail. The physical landscape of the lake is quite diverse; the southern end of the lake is wide and the shoreline is dotted with beaches while the northern end is so enclosed with mountains, it feels almost like a fiord. Lake Garda also has five islands, the larger Isola del Garda and Isola San Biagio and the smaller islands of Isola dell’Olivio, Isola di Sogno and Isola di Trimelone. Isola del Garda is open for guided tours by the owners of the island, the Cavazzo family, which features a remarkable neo-Gothic villa and outstanding gardens. Isola San Biagio is also incredibly beautiful and offers great camping with expansive views of the lake. The islands showcase some of the wonderful wildlife of the area; the lake also contains a species of salmon, the “Trota del Garda”, that is unique to the area. While the physical beauty of the area is apparent, it also has some diverse offerings. Lake Garda is home to Gardaland, the biggest amusement park in Italy, which can be reached by bus from most of the towns around the lake. In nearby Lazise, the spa Parco Termale del Garda offers thermal lakes, pools and fountains built on the wooded grounds of an 18th century villa. However, if a more historical perspective is sought, visit the town of Peschiera del Garda, whose fortress dates back to the 1400’s and whose famed military jail, closed since 2002, is a popular site. Located on a peninsula on the south end of the lake, the ancient town of Sirmione is surrounded by the beautiful crystalline waters of the lake and offers urban shops, bars, restaurants and hotels as well as 13th century castles and ruins. It is also home to a sulphur spring, renowned for it’s healing properties. Lake Garda is also well known for both it’s olive oil and it’s olives; the wine is also high quality, showcased at the Wine Festival in Bardolino, which is held for a week every year in October. For those seeking a cross-section of historical sites with modern amenities in a superb natural setting, Lake Garda is a perfect destination. Referred to as “the lioness of Italy”, Brescia is a workhorse, a city whose reputation is built on the incredible work ethic of its inhabitants. It has been a significant cultural center from the Roman era, during which time the city flourished with a strong economy and a peaceful population. Though Brescia suffered from a period of barbarian raids and later from battles with neighboring cities, it remained an important center in Italy. The fighting spirit of the city was demonstrated during a rebellion against Austrian rule in 1849 and again during World War II when the city was rewarded with a Gold Medal for its resistance against Fascism: the “lioness” has well earned its name. With a population of 190,000, Brescia is the second largest city in the Lombardy region and is one of the largest industrial centers in Italy. Though the city is known for its hard working nature and defiant spirit, it is also a beautiful city that features 72 stone fountains, ancient piazzas and numerous churches and museums. Two remarkable examples of the history of Brescia are the Duomo Vecchio and the Duomo Nuovo, or the “Old Cathedral” and the “New Cathedral”. Duomo Vecchio was built in the 11th century and houses significant paintings from several Italian painters as well as the sarcophagus of Berardo Maggi, a former Duke and Count of Brescia. The Duomo Nuovo was built over a period that lasted from 1604 through 1825, which gave the structure a varied and unique style, ranging from Baroque to Neoclassical. On top of the Colle Cidneo (Cidneo hill) is the Castle of Brescia, built in the 12th century and offering remarkably expanse views. It is a popular hike for Brescian residents. The many piazzas throughout the city provide historical references, tranquil environments and local flavor, to include the Piazza della Loggia, the Piazza del Foro and the Mercato dei Grani in the Piazzale Arnaldo, Yet, despite these cultural touchstones and the fascinating history of the city, it is the famous car race, the Mille Miglia, that Brescia is best known for as the city was both the start and arrival spot for the thousand-mile race. Though the race was halted in 1957, it still holds fascination within the sports community. It is not surprising that Brescia, with her tough spirit and determination, should forever be associated with the race of endurance. The Accademia Carrara is an art gallery and academy of fine arts that gets its name from the Count Giacomo Carrara, a wealthy art patron who died in the late 18th century. He left a fantastic endowment to the city of Bergamo, which was collected in the museum that stands today. The gallery opened in 1793, just three years before his death, during which time Carrara insisted instruction in drawing and painting be offered. Classes were immediately implemented at the museum, and as of 1912 the academy and gallery are in adjacent buildings. The museum now houses almost 2000 paintings from 15th-19th century artists. 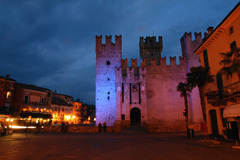 It is located in the Piazza Giacomo Carrara. Nestled in the lower Alps amid the highly industrialized area of Bergamo and Brescia lies the serene Lago d’Iseo, or “Sebino,” the fourth largest lake in Lombardy. There are numerous port villages, activities, and tourist spots surrounding the lake, though the lake itself is a well-hidden treasure that has yet to be spoiled by swells of visitors. The Lago di Como is well-known as one of the most beautiful lakes in the world, and certainly in Italy. It is renowned for its rich and famous patrons, as the lake accommodates numerous villas along its shores. Several small towns skirt the lake’s edges, making it an attractive tourist spot from many directions. Despite its beauty, beware of getting too close: in recent years the lake has been condemned as too polluted to swim in. Quite essential to the Cathedral of Cremona stands the Torrazzo, the church’s belltower and a proud landmark of the town center. At 111 meters (~364 feet) the Torrazzo is the third tallest brick belltower in the world and is successfully the oldest standing brick structure of over 100 meters worldwide. Records indicate that construction of the tower began in 754 but was not completed until 1309. To continue with its streak of remarkable statistics, the belltower’s fourth story holds the world’s largest astronomical clock, built by father and son Francesco and Giovan Battista Divioziola between 1583-1588. Located proudly in the Borromean Gulf near Lake Maggiore are the Borromean Islands which consist of three small islands (Isola Bella, Isola Madre, Isola dei Pescatori) and two islets (Isolino di San Giovanni, Malghera). The islands, which altogether make up just 50 acres of land area, are named after the wealthy Borromeo family who acquired them in the 16th century. The family still owns three of the islands and makes the occasional visit to fish and relax in the picturesque setting. The three major islands are renowned for their rich gardens and palaces.